Hey Ppl!! I am glad to finally get the time to post on my blog again…..
As a part of my curriculum I had to create an online shopping cart. Since I thought of doing it in JSP where in I could some AJAX to make it fancier :). Well the choice of IDE for me was to go for RAD (Rational Application Developer) 7.5 with WAS (Websphere Application Server) CE and DB2 as the back end.This is a basic project but is a good learner for those who are new to JSP, servlets or AJAX. This is also be useful if you are looking to get familiarized with the IDE. Lets draw an outline of the project. We have 2 use cases to the project viz Administrator and Customer. We take them one by one. Lets take up the database for such a system. 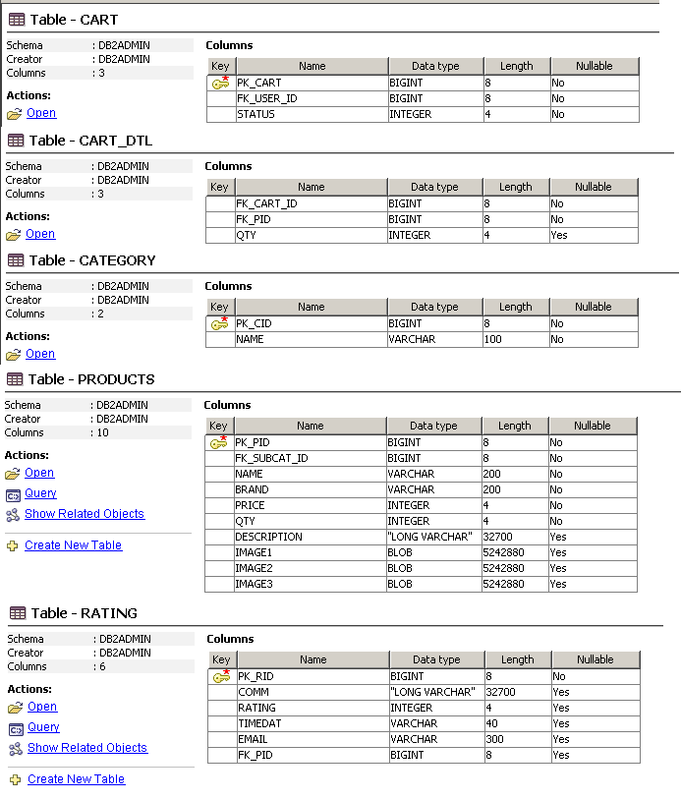 I have taken the snapshot right out of DB2 listing the tables there in (click to expand). Lets look at the snapshots of the project first and then we will discuss the problems faced and their solutions. Creating & calling stored procedures on DB2. dont forget to test the connection. Now you can use this class to instantiate it in JSP or as Beans..
temporary folder on the server then onto the database. Just include the library in your path or add it as a reference. Add provision for product offers or discount offers. Recommended products can be evaluated via Apriori algorithm. Finally, here you can download the complete workspace for the project. Nice post!…. although i have not read it — as claimed by the author! but why all d t-shirts were bought by u only.. I could put a copyright symbol and fancy stuff like people do, but who am I kidding. No one reads the footer.